E xecutive Vice President, Dennis Franks, joined Motivational Speaker and Author Vince Papale on-stage to talk about their new book, The Last Laugh: Vision to Victory, on-stage yesterday for day two of MAWC 2018! The energy in the Coliseum was electric as the duo lit up the room with their inspiring energy! Both Dennis and Vince were members of the Philadelphia Eagles. While Vince was the subject of “Invincible” starring Mark Wahlberg as Vince Papale, Dennis Franks has been working hard to build his own UnFranchise Business with TLS Weight Loss Solutions as he wrote the newly published piece! 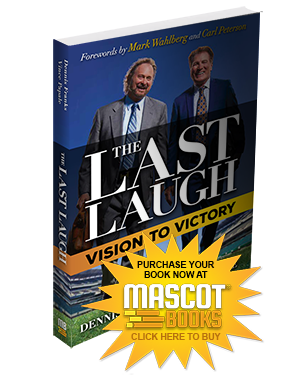 Their new book, The Last Laugh: Vision to Victory, is a motivational piece of work that tells the story of Dennis and Vince’s friendship as well as the lessons the two have learned over their years together. The book shows how dreams can be achieved when you are truly determined to achieve your dreams! If you thought you were tired after 2 busy days in Miami, think again! Dennis + Vince have been bouncing between interview after interview before and after a full day’s worth of MAWC fun all for you. They skipped lunch each day and spent hours after each day of MAWC 2018 to sign your copies of The Last Laugh: Vision to Victory, share their inspiration, + be inspired by your own UnFranchise success stories! The Last Laugh: Vision to Victory is now available for purchase– exclusively on SHOP.COM! The perfect finishing touch to MAWC 2018, this book outlines the against-all-odds story by Former NFL players, turned entrepreneurs, Dennis Franks & Vince Papale. Part memoir and part success story, this book is a must-read.